Rain may have its own effects on the weather but it has become normal to see the complete collapse of the traffic system while it rains. The traffic police have very little blame on their shoulders as the majority lays behest the drivers, as they panic on the first drop of rain and drive by their own rational rules. Wider roads which are ending at bottlenecks are prone to a traffic jam mainly because of the people trying to merge wrongfully from the left of the road making the first and second lanes stack up long queue of cars, if everyone keeps their patience and adhere to the traffic line, than all can be home on time. The other major problem that result’s in traffic jam is that, drivers are reluctant to pass deep standing puddles, unable to dispel in the storm water drains quickly due to the litter stuck on its grills, even though everyone have been driving through these roads everyday and know it quite well. So stick to roads you know best. Being steady is good but being slow and unresponsive to signals by other cars makes those drivers impatient resulting in stupid moves to pass you over. 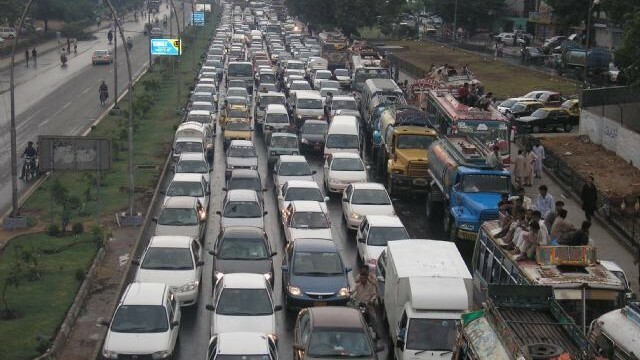 A) Keep your calm: The main cause for traffic nuisance in Pakistan, always keep be patient and stick to roads and routes you know so good that you can even drive with your eyes closed. B) Braking sooner: Brake earlier and with less force than you would normally. Not only does this increase the stopping distance between you and the car in front of you, it also lets the driver behind you know that you’re slowing down. Also, be more meticulous about using turn signals, so that other drivers know your intentions, and take turns and curves with less speed than you would in dry conditions. C) Track the car ahead of you: Let the car ahead pave a clear path, through the water. But do not stall before a puddle waiting for someone to be the first rather choose a route where you know every road of the route. D) Defogging windows: If you don’t want to open your windows than turn on the air-con to defog the windows. E) Check your brakes – If you successfully pass through a deep water hazard, test your brakes. They may be saturated, and only driving very slowly and braking lightly at the same time will generate enough heat to dry them out. Be sure they are pulling evenly on all wheels before building up speed again. These are some of the very important checkpoints you should exercise in rain but obeying the traffic laws would help everyone more.